For most of my classroom teaching years, I had third graders and they loved Halloween. I did, too, but I always stressed over the chaos of the few days before that last day of the month. So, how can I help you tackle this day with STEM? Keep reading! Prepare for the wild days and, especially the surprise days when you need a sub unexpectedly. Use an Escape Room for your party! I would say the week leading up to October 31st is the wildest week ever in an elementary classroom. What are some ways to keep kids engaged and working on skills? If you use math centers or need independent work while you are teaching small groups then sets of math worksheets or games can be a lifesaver! But, what if you are a specialist? Guess what? Math games can work for you. These can be great for early project finishers or for those days you have a sub. It happens! I like these resources because the prep is so easy. Just print, make some copies, add some number cubes and game pieces (like colored tiles) and have a bag of items ready for teams of students or for your substitute. The game boards are decorated with Halloween characters and with a roll of number cubes two students can compete and have fun practicing math skills- like doubling two number or multiplying two numbers. The grid game is one of our favorites! It actually practices multiplication facts, but it's a fabulous strategy game, too! Placing those grids on the paper can be 'tricky'! 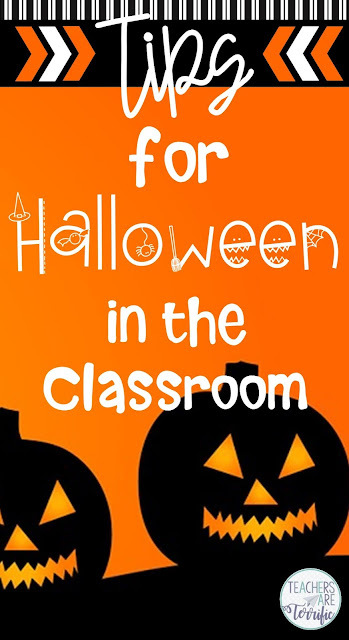 TIP: Tame those wild days before Halloween with math pages! Believe it or not, STEM Challenges with a Halloween theme are perfect. We have tried several different challenges! The absolute favorite is a Pumpkin Launcher. The students use some unusual materials to build the launcher and then we add small candy pumpkins as the projectile. Our favorite part of this is building cup structures and trying to knock them down. The Halloween Maze project is a very calm STEM Challenge. It involves creating a maze and then testing it with a rolling item. You can use marbles, but I found 'eyeballs' at the dollar store and that makes the maze even better! The Pumpkin Elevator is one I use with my 5th graders! They have to create a cranking device to lift a platform they also build. They must raise a small pumpkin with the elevator! We either use small plastic pumpkins or ones you buy in the produce section. We also lifted small black cauldrons full of candy one year! TIP: Add a STEM Challenge to that week before the 31st! STEM Challenges are highly engaging and full of problem-solving. Last fall, we added Escape Rooms to our STEM class and it has been an amazing adventure. Kids love the puzzle activities and the level of engagement and problem-solving is phenomenal. We just finished testing a new Escape Room designed for Halloween! My escape rooms have three locked boxes and the students complete three tasks to determine the lock codes for the boxes. Don't worry about buying boxes and locks! You can use a cardboard box and the resources have a 'paper lock' system that you can use. The tasks in this one were really fun to watch as the students worked on them. The first task is a math riddle/joke page. The second task uses a coordinate grid and students plotted points to draw a Halloween character. The last task is a Halloween puzzle they must put together. When that last locked box is opened students are awarded a Criteria card for a STEM Challenge. They grab a materials bin and start designing a Pumpkin Launcher. The pumpkin launcher challenge that is included in this resource is different from my original pumpkin launcher challenge and is only available as part of this Escape Room. TIP: Have you tried an Escape Room yet? Try an Escape Room as the preliminary to your Halloween Party! Inside the last locked box place a small candy prize- like a bag of candy pumpkins and then have kids design the pumpkin launcher for them! I have a free sample from the Halloween Escape Room! It provides you with one of the tasks, the box labels, paper lock strips. a hint card, 2 small certificates, and 2 pages of teacher directions. Click below! Bonapart is a young skeleton that is literally falling apart. His friends jump in to help him get himself together. Franky Stein tries glue and screws, Mummicula tries a wrap to hold him together, and Blacky Widow gets him tangled in her web. This is a fun book to read - full of puns about bones. Pair it with a skeleton STEM Challenge or Escape Room! Although this book has nothing to do with Halloween it is still a "scary" book. Jasper Rabbit loves carrots and finds himself being stalked by them. He hears them coming or moving with a persistent tunktunktunk and thinks they are everywhere- even in his tub. Kids love this one! How I love Eve Bunting! This delightful poem style book describes a collection of trick or treaters that are being spied upon by something with glittering green eyes. Each page is beautifully illustrated with the costumes of the children in the book and jack-o-lanterns that line the pathways and fields. It turns out the green eyes belong to cats that are also on the Halloween prowl! TIP: Read a book as the introduction to a STEM Challenge or math activity. Creepy Carrots is a suspenseful story that has carrots multiplying- perfect for a read-aloud as you start a session of math games- think about the game I mentioned that has students creating arrays. Scary, Scary Halloween would be great to read and then challenge students to use the illustrations as inspiration for designing a Halloween maze. How to Have a Blast with Balloon Cars!